When [Edward Snowden] smeared the internet with classified NSA documents, it brought to light the many spying capabilities our government has at its disposal. One the most interesting of these documents is known as the ANT catalog. This 50 page catalog, now available to the public, reads like a mail order form where agents can simply select the technology they want and order it. One of these technologies is called the Sparrow II, and a group of hackers at Hyperion Bristol has attempted to create their own version. The Sparrow II is an aerial surveillance platform designed to map and catalog WiFi access points. Think wardriving from a UAV. Now, if you were an NSA agent, you could just order yourself one of these nifty devices from the ANT catalog for a measly 6 grand. However, if you’re like most of us, you can use the guidance from Hyperion Bristol to make your own. They start off with a Raspi, a run-of-the-mill USB WiFi adapter, a Ublox GY-NEO6MV2 GPS Module, and a 1200 mAh battery to power it all. Be sure to check out the link for full details. [Hunter Davis] used an old license plate as a tablet stand. It loops around the leg of his laptop table and has a cutout for the power cord of the tablet. It may look stock, but this power wheels is hiding a new frame, motors, and tires. You won’t see it in the Power Wheels Racing Series, but it is a ton of fun for this lucky kid. Want to play a game? A yellow briefcase hijacks surveillance camera feeds and lets those monitoring them play chess via text message. Here’s another rendition of an ATX bench supply. [Ast] rolled in a voltmeter for the variable voltage plug, and an ammeter to finish off the hack. In a move reminiscent of [Ferris Bueller], [Sepehr] coded a Lync auto responder to answer the boss when he sends an IM. [Thomas Renck] recently picked up a 1000mW wireless video transmitter that he ultimately planned to mount in an RC plane. Before he strapped it on a plane to potentially kiss it goodbye for good, he wanted to play with it a while to see what it was capable of. After a friend helped him determine the camera’s maximum range (about 1900 feet on open ground), he thought it would be fun to strap it on his nitro R/C truck. That didn’t work out so well due to some vibration issues, so he constructed a makeshift R/C car from the shipping box the camera arrived in, along with some other odds and ends. As you can see in the video below, the propeller-driven “Boxmobile” zips along quite nicely. The video feed from the camera is pretty impressive too, allowing him to easily guide the car while it’s well out of sight. 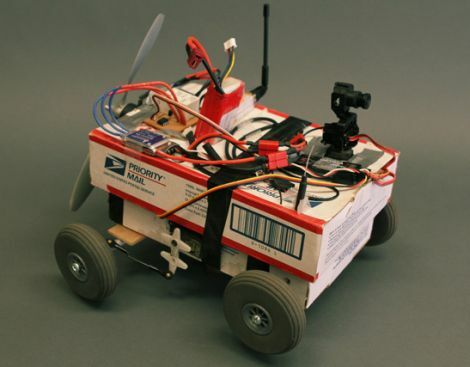 At nearly $350, the self-proclaimed “ghetto-bot” is certainly not cheap, though we hear body repairs are a piece of cake! We’re always fascinated by flying drones around here, and this latest creation by Japan’s Ministry of Defense is no exception. 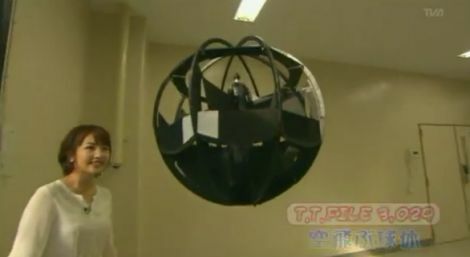 The spherical drone, which looks far simpler than this drone we saw several months back, looks pretty benign at first glance. Once it starts moving however, you can see just how slick it is. Reports say that it can hit a top speed of 40 mph, but it seems that the fun is relatively short-lived, as the drone runs out of juice after about 8 minutes. While it is flying, the drone appears to be incredibly agile and fairly easy to control. The built-in camera isn’t top end, but it looks more than sufficient for general surveillance use. While we love quadrocopters and all of the cool acrobatics they pull off, there’s something awesome about a drone that can hit the ground at speed, roll, and take off again without incurring any serious damage. Anyone care to start work on a civilian prototype with a longer battery life?